COMFORT - Consistent and constant indoor air temperatures provided by thermal mass of the finished concrete floor of the whole house. 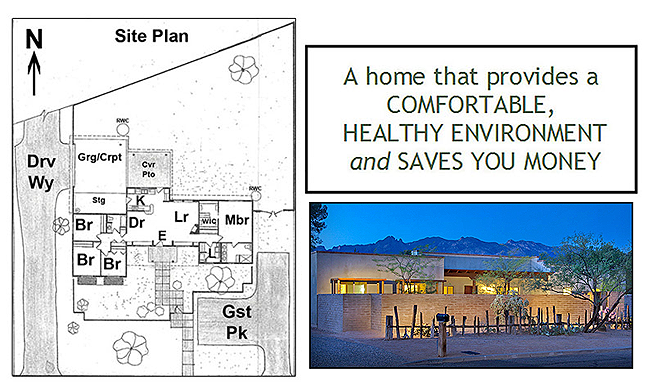 Thermal energy, warm or cool, delivered by innovative hydronic radiant system via embedded tubes in the slab. No forced air operation - no hot or cold drafts. UTILITY SAVINGS - Electric use bills from Tucson Electric Power expected to average near zero dollars on an annual basis! FINANCIAL GAIN - Hundreds of dollars each month 'in your pocket' with near zero utility bills.